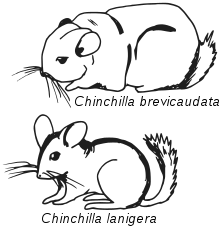 The chinchilla is a relatively small rodent. They live in the Andes Mountains in South America. They are active during dusk and dawn. Such an activity pattern is named for crepuscular. Together with the Viscacha, they form the Chinchillidae family. In their usual habitat, chinchillas live either in burrows, or in crevices of rocks. They are good jumpers, and can jump very high.They use their tails to help them jump. Chinchillas live in colonies. The females are much bigger than the males. Predators in the wild include hawks, skunks, felines, and canines. Wild chinchillas seem to feed on plants, fruits, seed, and small insects. Chinchillas have been domesticated and are sometimes kept as pets. Their diet is mostly based on hay. Chinchillas make a variety of vocalizations, including chirps, squeaks, and barks. They can be found in a variety of colors and mutations. Chinchillas are sexually mature by the time they are eight weeks old. Chinchillas can not get wet. If they do their fur will get moldy and that can cause an infection. That infection can cause the chinchilla to die. So instead of taking baths in water they take dust baths. The dust also has nutrients that chinchillas need. ↑ 1.0 1.1 "brainmuseum.org". brainmuseum.org. ↑ Animal-World. "Chinchilla". Animal World.